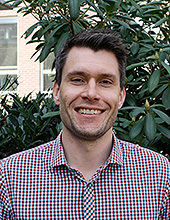 As associate professor in Computational Failure Mechanics, Martin Fagerström focuses his research on developing reliable and computationally efficient models for simulating failure in various types of materials. In current focus are lightweight materials and structures relevant for the automotive industry with coupling to Chalmers area of Advance Transport. Martin is also Competence Area Leader for "Structures and Materials" at SAFER (Chalmers Vehicle and Traffic Safety Centre), responsible for the coordination of material and structure related research issues with respect to traffic safety. There might be more projects where Martin Fagerström participates, but you have to be logged in as a Chalmers employee to see them.